Biological taxonomy has incorporated novelty into its codified systems. But perhaps it is is a folk category anthropologists assume when thinking about relatedness. In laboratories around the world, brave new organisms are lustily brewing in warm liquid media. These microbes are invisible to the naked eye, but even under a microscope they seem unremarkable—a cell, nothing more. Look closer. Here’s a bacterium whose genetic material includes genes from a diverse bestiary: Icelandic hyperthermophiles, petunias, yeast, perhaps a bit of bioluminescent jellyfish. Synthetic biologists have cobbled together these critters to get them to generate new chemicals, from perfumes to pharmaceuticals. Now think back to the biological tree of life you no doubt saw graphically represented on the pages of your high school biology textbook—kingdoms, phyla, class, orders, families, genera, and species ramifying from root to apex. Or recall the tree of life diagram that Charles Darwin hastily sketched on the underside of one of his children’s drawings, annotated only by the cryptic phrase “I think.” Where might you place this microbe on such paradigmatic trees? If you’re baffled, you are not alone. So are many synthetic biologists. Biological taxonomy, the study and sorting of how different organisms are related to one another, has for centuries incorporated novelty into its codified systems. During the age of exploration through the Victorian era, strange new zoological and botanical specimens brought back to Europe on ships were pigeonholed using morphology—how they looked—into existing taxonomies. But by the mid-20th century, an organism’s morphology no longer defined what it was, as new technologies began classifying organisms on the basis of how similar their proteins and nucleic acids (DNA and RNA) were to one another. The system scientists most commonly use today was first introduced by Carl Woese in 1990, in which phylogeny (defining groups of organisms based on common descent) is established by comparing the sequences of a highly conserved genetic molecule called 16s ribosomal RNA. 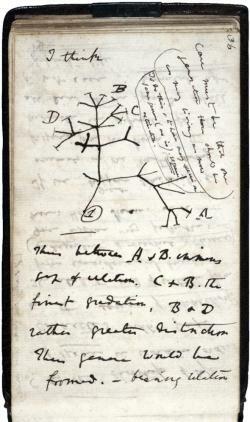 Page from Darwin’s notebooks around July 1837 showing his first sketch of an evolutionary tree. To return to our original question, where might a synthetic microbe fit into such biological taxonomies? In her work The Synthetic Kingdom, artist Alexandra Daisy Ginsberg suggests, “We will have to insert an extra branch into the Tree of Life. The synthetic Kingdom is part of our new nature. How else will we make sense of this novel menagerie of engineered life?” Perhaps this is so. However, another way of thinking about this conundrum comes from an unlikely source—kinship theories first developed by anthropologists. Understanding how people decide who is related to whom and why has been anthropology’s bread and butter since its origins in the 1870s. One key contribution of kinship theory is that social relations like marriage, siblingship, lineage, and descent are not universal categories. Rather, they vary significantly between, say, the Hagen of Papua New Guinea and late 20th-century British people. But in the late 1960s and early 1970s, some cultural anthropologists made an important realization: Perhaps biology is itself a folk category that anthropologists assume when thinking about relatedness. To put it simply, even when kinship is based entirely on a legal institution like adoption, the tie between two people is always modeled on the assumption that people are “normally” related because they share biological substance like blood or genes. But why must this be so? This is a question that has most recently been explored by feminist anthropologists and queer theorists, who want to clarify how queer people forge families that are not necessarily based on straight models of siblingship or parentage. Think, for example, of the 1990 documentary Paris Is Burning, which depicts the LGBTQ underground New York “ball culture” scene. Ball and drag communities are to this day often organized into “houses” presided over by a house “mother” or “father” who is responsible for their “house children.” These parents provide emotional and material support to queer youth who may not maintain ties with their families of origin. Members of such houses often take new surnames to reflect these new alliances. With this in mind, let’s return to that strange microbe bearing genetic material from jellyfish, yeast, and petunias, among other things. I’ve described it as strange, but another word for strange is, of course, queer. Could queer kinship perhaps help us make sense of these new taxonomic conundrums that synthetic biologists engineer? Such microbes are generated not by clear biological ties—they have no obvious “parentage” or “ancestors,” and trying to track their genetic taxonomies obviously won’t get us very far. Many synthetic biologists explain that the work they are doing, moving genes from one species into another, isn’t significantly different from what already happens in nature. The Human Genome Project and subsequent sequencing research revealed that our genomes contain lots of nonhuman DNA (including genes from Neanderthals and viruses). The growing field of microbiome studies has brought to our attention the fact that the majority of the cells in our bodies are not human but microbial or fungal. And biologists now know that lots of different organisms, from bacteria to fungi to insects and plants, engage in what is now termed “lateral gene transfer” or “horizontal gene transfer”—moving genes between different organisms that are unrelated, which has significantly changed the way biologists understand evolution and adaptation. Many synthetic biologists refer to their engineering work as simply being “artificial horizontal gene transfer.” These cases suggest that today, biology is distancing itself from the tree of life. Many biologists now favor a model that looks more like a web to visualize biological relatedness. The reason why this is so important is because it speaks to a common sentiment of our times: Any kind of theory of relatedness, whether human kinship systems or biological taxonomies, is something people make up to suit certain functions and requirements, and in so doing they make choices about what kinds of qualities matter when sorting species and people into either trees of life or family trees. 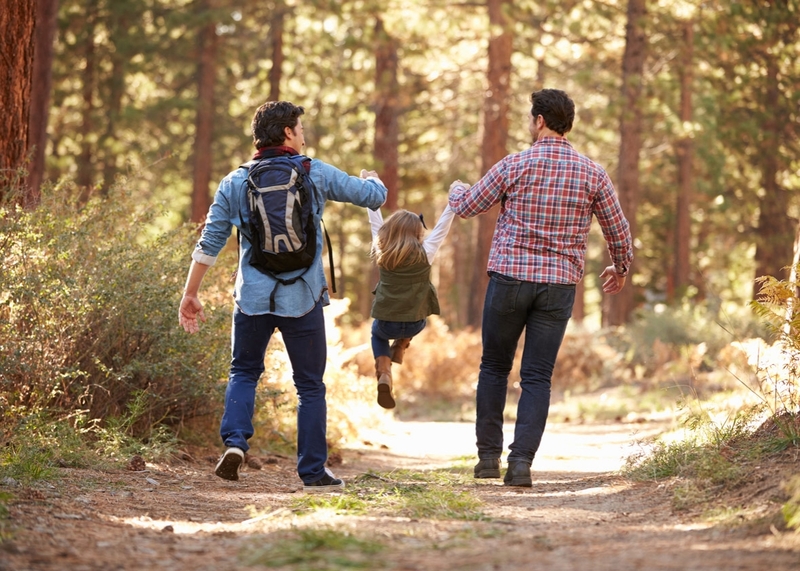 Cells that embed diverse genetic parts remind synthetic biologists that “natural” taxonomic systems were never really accurate representations of biological relatedness; queer families remind us that there’s no such thing as a “natural” family that wasn’t already sanctioned by social, legal, and cultural norms and decisions. New techniques in DNA synthesis—such as the CRISPR/Cas9 system and gene drives—promise to make it easier for synthetic biologists to genetically modify much of the living world, from hypermuscular mice to allergen-free peanuts to “humanized” pig organs. The future promises to be very queer, indeed.